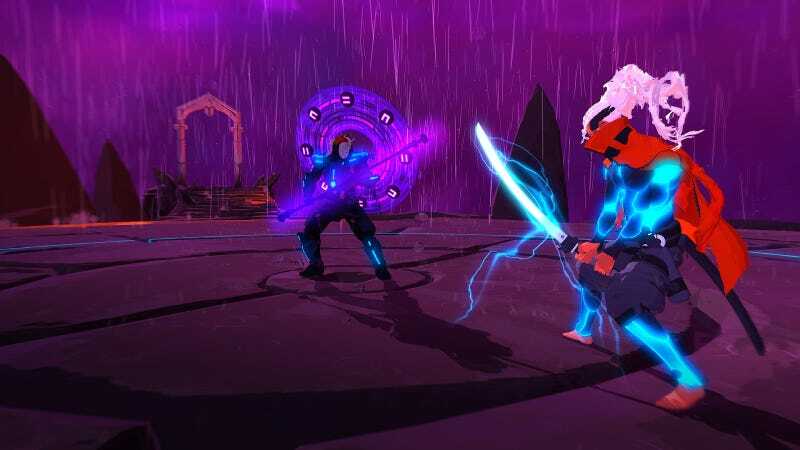 Furi, a neon boss-battling bonanza, came out for the Nintendo Switch last week, which finally gave me good cause to sample its hack-and-slash action. Fights in Furi, which came out in July 2016 for PC, Playstation 4, and Xbox One, take place on massive battlefields that are sometimes constrained. That ebb and flow challenges the player and helps bring variety to a gauntlet of grueling duels. There’s only one thing to do in Furi: fight bosses. The player takes up the role of a mysterious warrior trying to escape a prison guarded by numerous wardens and warriors. Combat is set on large battlefields where enemies fire energy beams, charge you with melee attacks, and spew orbs that fill the area like a bullet-hell shooter. You can shoot, dodge, parry, and slash through numerous phases of increasing complexity. Some bosses are straightforward and some are exceptionally complex. But Furi uses a very simple shift in perspective and space to breathe life into these encounters. After you’ve done a certain amount of damage to a boss, a small circle will appear around it, and it will become invulnerable to projectiles, forcing the player to charge into that circle. This constricts the action and keeps both the player and the boss inside a small area. This occurs multiple times in each fight and helps establish a ping-pong rhythm for each encounter. Action starts large, contracts, blasts outwards, and then closes in once more. Furi’s boss fights are very long, but by shifting the scale of the fight, the game never feels boring. By limiting the player’s space, Furi also encourages the player to use different skills. When the action is at a distance, the player can blast away with their gun. When things get more constricted, they’ll have to rely on dodging and parrying to survive. Bosses can sweep large areas with unblockable attacks that the player can only escape with a dash. If you’re hurt, a boss will tend to follow up with a string of lighter attacks. Because the tighter space leads mistakes to be more punishing, the player needs to use every tool at their disposal. They can’t rely on a single strategy or technique to sleepwalk through fights. Switching between these two modes also gives Furi the opportunity to teach players before testing them with more difficult variations of attacks they’ve already seen. For instance, the fourth boss emanates powerful energy waves that the player must dash through in order to avoid damage. The boss first uses this attack when the battlefield is open and the camera is pulled back, giving the player plenty of time to dodge. Then, once the battle area is constricted, the game has already taught the player to recognize that animation, so if they’re good enough, they’ll remember to dodge it, even in a trickier, tighter spot. The use of wide and small spaces is a powerful tool for crafting memorable fights in Furi. It changes the pace, forces players to use a variety of skills, and challenges players to survive remixed version of previous boss attacks. It’s a small feature that has a huge impact.